16 Oct 2012: Added: Robert B. Johnson to Crew Honor Roll. Once again "Thank You" to Tommy Mayfield for notifying us of the passing of your crewmate. 29 April 2010: Added: Paul (Kaschmarchik) Kasmer to Crew Honor Roll. Thank you Tommy Mayfield for notifying us of the passing of your crewmate. 18 July 2006: Added: Additional photos to Crew 43 Photo Section and a photo of 39er believed to be on P-43 Ground Crew. 15 July 2006: Added GO 64 Award of DFC for Capt Arvin, 1st Lt Lapinski and S/Sgt James C. Wilkes, Jr. - Orders and photos are courtesy of Greg Wilkes, Son S/Sgt James C. Wilkes, Jr., Radio Operator, P-43; Thanks to Martin McDonough. LG, for helping identify the members of his crew in the Wikes Photos. 01 June 2006: Added 1st Lt Glen Durkin, to Crew Honor Roll. The crew of the "Lancer" left the Continental U.S. April 1945. They were assigned to the 62nd Bomb Squadron and flew their first mission on Kanoya April 21. It was the first 22 missions they would fly. Captain Edmond T. "Red" Arvin, Jr., 1st Lt Stanly A. Lapinski and S/Sgt James C. Wilkes, Jr. were awarded the Distinguished Flying Cross (per GO 64 Section XXXI dated 15 Sept 1945, issued by HQ 20th AF) for the 11 May mission on the Kawanishi Aircraft Factory at Kobe, Japan. The crew was awarded the Air Medal 4 June and another 20 July 1945. 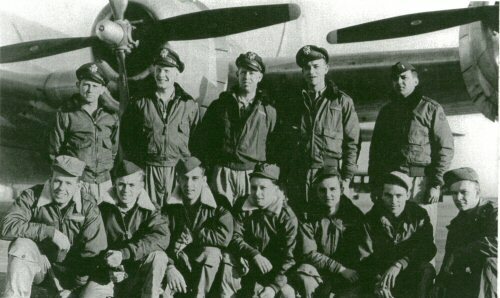 After an aborted mission of 3:30 hours on August 10, the men of the "Lancer" were flying back to the United States for ten day stay at the Rest and Recreation Center. They missed the end of the war by just a few days. No one ever made any reference about being "sad" concerning this situation. No boat ride or the pleasure of the "Sunset" trips months later. "This was the name of a lesser known fighter plane - of limited production - a forerunner to the P-47. Capt Arvin knew of this and it was his idea to nickname our P43 "Lancer". " Martin painted "Lancer" on the nose of their B-29; in addition he painted the names or nickname if they prefered next to each man's window.